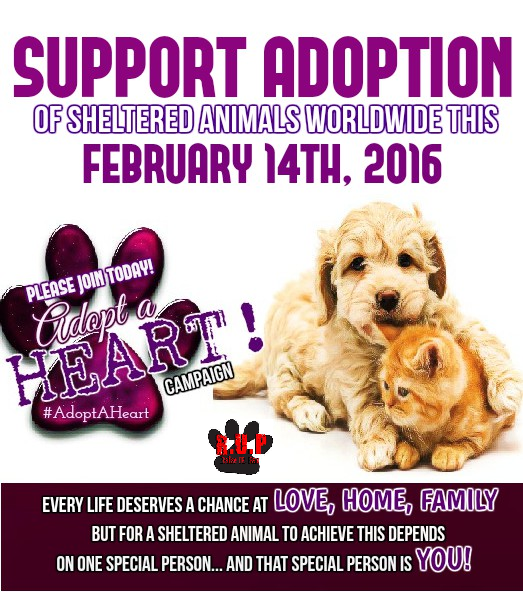 The ADOPT A HEART campaign promotes adoption of sheltered animals and raises awareness of the countless lives who are waiting to be adopted, fostered and rescued by special individuals like you. Established around the many souls in need of our help, this campaign uses the compassion, love and of course the hearts of individuals to bring upon second chances, new leases on life, and bring the commitment and love a permanent home and adoptive family can provide. Although this our first year launching this campaign, we at RAISE UR PAW, a Canadian Federally Incorporated Not-For-Profit, hope that we can not only come together united and save the lives of the innocent but to also make this campaign a successful one, where we can continue on for many years to come. Taking the moment to lend not only your voice and heart to this awareness campaign and extend the reach for adoptive homes and families this Feb. 14th,2016 will help achieve not only our goals, but save and give the new lease on life for sheltered animals in need of forever unconditional love and homes. For that second it takes to put up a picture, share a story or just even use the hashtag #AdoptAHeart, you will be encouraging, promoting and educating about the importance of adoption, so that other individuals can experience the rewards and fur-ever happiness that comes with saving a life --- for even saving one life may not change the world, but for that one life the world would be changed forever. We Hope You Will Raise Ur Paw and Take Part - Because Every Life Deserves to Have That Chance at A Home, Love, and Family - But for a Sheltered Animal To Achieve This Depends On One Special Person and That Special Person Is You!